Parts J23100 through J23119 are a family of constitutive promoter parts isolated from a small combinatorial library. J23119 is the "consensus" promoter sequence and the strongest member of the family. All parts except J23119 are present in plasmid J61002. Part J23119 is present in pSB1A2. This places the RFP downstream of the promoter. Reported activities of the promoters are given as the relative fluorescence of these plasmids in strain TG1 grown in LB media to saturation. See part BBa_J61002 for details on their use. Jasonk:I suspect that J23102 is in this well rather than J23106, I'd sequence it before using. The promoter we assessed was cloned via Gibson Assembly into the pSB1C3 backbone alongside an mNeongreen fluorophore as a reporter. This plasmid was then transformed into DH5alpha super-competent E. coli cells, and the fluorescence and absorbance recorded over the course of 142 hours. The data points were then fitted to a hyperbolic trend line to demonstrate the increase in fluorescence over time. This correlates to the increasing quantity of protein generated, which is directly tied to the strength of the promoter attached. These studies were done in both LB and M9 media to compare the rate of fluorescence in translucent vs. a transparent medium. As predicted, the M9 medium gave much more reliable results. Below are graphs demonstrating the level of fluorescence generated by the proteins attached to this promoter. It was also compared to the fluorescence generated by a Red Fluorescent Protein (RFP), for some idea of context. A more useful comparison can be made from the graph of concentration, which was derived from the absorbance of each sample. The Red Fluorescent Protein was synthesized using the promoter BBa_J23100, and so the difference in the concentration between the two indicates the relative strengths of the BBa_J23100 and BBa_J23106 promoters. It’s evident that the BBa_J23100 promoter is much stronger than the BBa_J23106 part, producing roughly 13x more RFP than the BBa_J23100 made of the mNeonGreen. 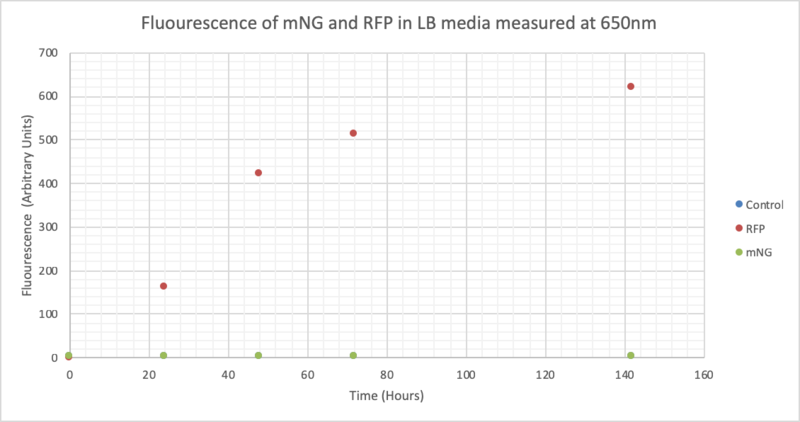 This graph depicts the difference in fluorescence between the mNeonGreen generated by the BBa_J23106 promoter and the RFP generated by the BBa_J23100 at a wavelength of 650 nm. This study was carried out in transparent M9 media. 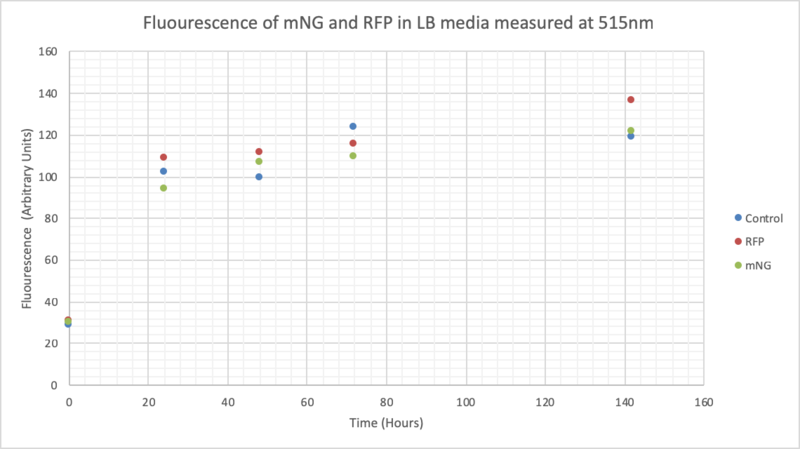 This graph depicts the difference in fluorescence between the mNeonGreen generated by the BBa_J23106 promoter and the RFP generated by the BBa_J23100 at a wavelength of 515 nm. This study was carried out in transparent M9 media. 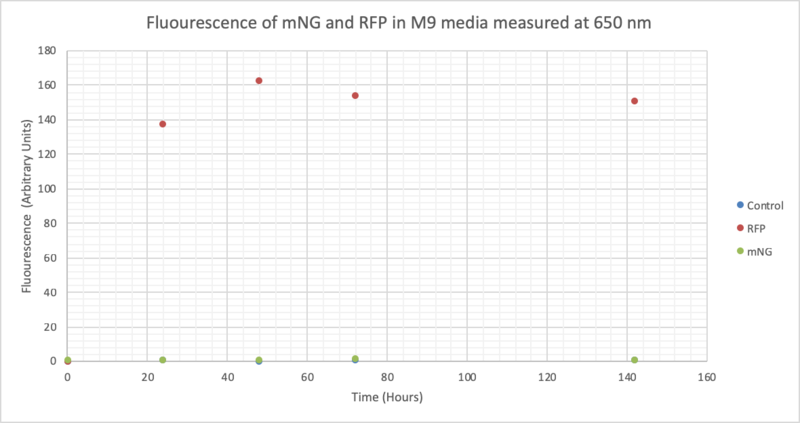 This graph depicts the difference in fluorescence between the mNeonGreen generated by the BBa_J23106 promoter and the RFP generated by the BBa_J23100 at a wavelength of 650 nm. This study was carried out in brown LB media. 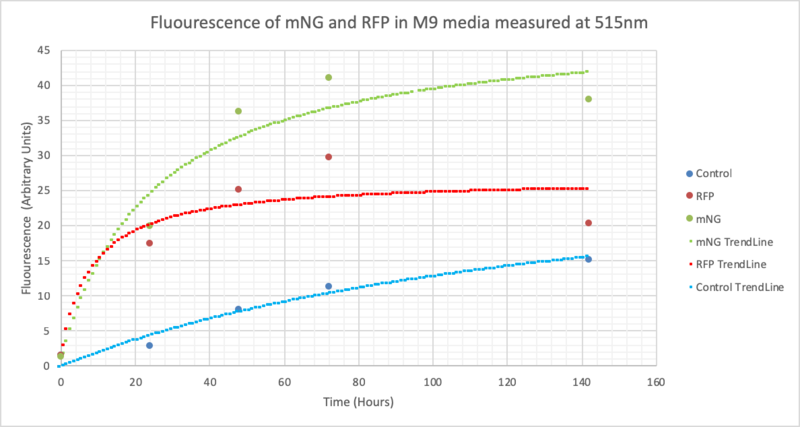 This graph depicts the difference in fluorescence between the mNeonGreen generated by the BBa_J23106 promoter and the RFP generated by the BBa_J23100 at a wavelength of 515 nm. This study was carried out in brown LB media. This graph shows the concentration of protein derived from the absorbance and the extinction coefficient of each respective fluorophore. Sheffield 2016 has improved the characterisation of both BBa_J23100 and BBa_J23106. These parts are a strong and medium promoter respectively, that we have used to design our iron detecting device. 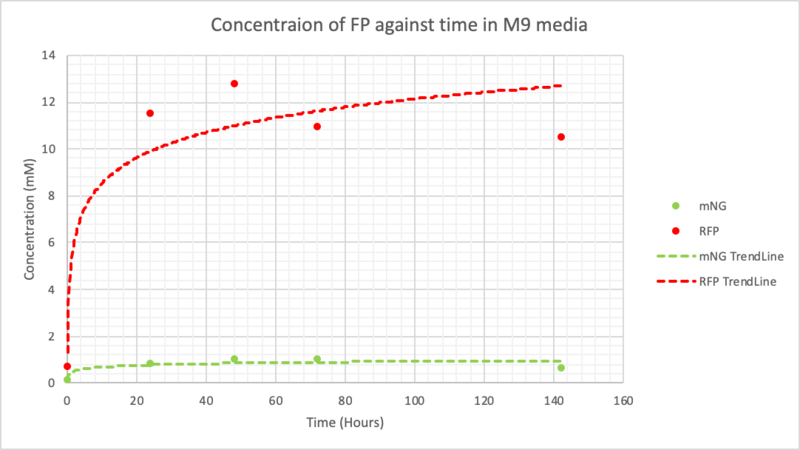 We have experimentally validated through fluorimetry that there is indeed a significant difference between expression levels of GFP coupled to the strong and medium promoters. Comparative analysis of promoter strengths can be directly interpreted from the data we obtained. This data can be found both on the original part experience pages of BBa_J23100 and BBa_J23106, as well as on our website. Fluorescence of JC28 mutants or W3110 wild types transformed with RyhB-GFP constructs under the control of medium (MedGFP) or strong promoters (StrGFP). Fluorescence microscopy and flow cytometry revealed decrease in fluorescence over time for members of the constitutive promoter family. - The weak promoter, BBa_J23114, exhibited a relatively low expression of RFP, indicating low gene expression and an increasing high level of noise throughout growth. - Both medium strength promoters, BBa_J23110 and BBa_J23106, displayed a moderate level of both noise and protein expression of the RFP reporter. - The strong promoter, BBa_J23102, exhibited a comparatively high expression of the reporter RFP and an increasing high level of noise throughout growth. Documentation: In order to create our complete part collection of parts compatible with the Golden Gate assembly method, we made the part BBa_K2656004 which is this part adapted to the Golden Gate technology. >Internal Priming Screening Characterization of BBa_J23106: Has no possible internal priming sites between this BioBrick part and the VF2 or the VR primer. The 2018 Hawaii iGEM team evaluated the 40 most frequently used BioBricks and ran them through an internal priming screening process that we developed using the BLAST program tool. Out of the 40 BioBricks we evaluated, 10 of them showed possible internal priming of either the VF2 or VR primers and sometime even both. The data set has a range of sequence lengths from as small as 12 bases to as large as 1,210 bases. We experienced the issue of possible internal priming during the sequence verification process of our own BBa_K2574001 BioBrick and in the cloning process to express the part as a fusion protein. BBa_K2574001 is a composite part containing a VLP forming Gag protein sequence attached to a frequently used RFP part (BBa_E1010). We conducted a PCR amplification of the Gag-RFP insert using the VF2 and VR primers on the ligation product (pSB1C3 ligated to the Gag + RFP). This amplicon would serve as template for another PCR where we would add the NcoI and BamHI restriction enzyme sites through new primers for ligation into pET14b and subsequent induced expression. 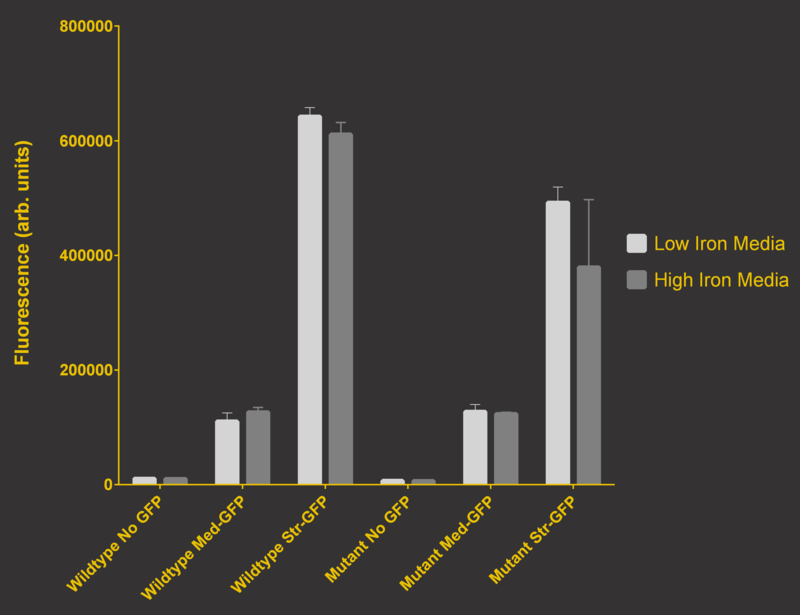 Despite gel confirming a rather large, approximately 2.1 kb insert band, our sequencing results with the VR primer and BamHI RFP reverse primer gave mixed results. Both should have displayed the end of the RFP, but the VR primer revealed the end of the Gag. Analysis of the VR primer on the Gag-RFP sequence revealed several sites where the VR primer could have annealed with ~9 - 12 bp of complementarity. Internal priming of forward and reverse primers can be detrimental to an iGEM project because you can never be sure if the desired construct was correctly inserted into the BioBrick plasmid without a successful sequence verification.